Like most places, your makeup bag probably accumulates extra stuff, a few pieces of trash, and random items that mysteriously appeared there. 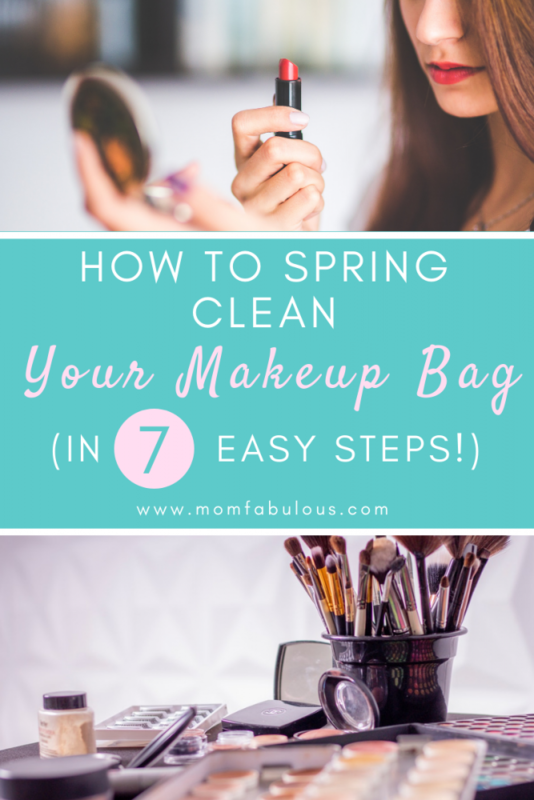 Take a few minutes this spring to clean out your makeup bag in a 7 easy steps. 1. Take all of the items out of your makeup bag. Find a clean spot on the floor or table to remove everything from your bag. Yes, it is important to remove everything (because in step 4 you will actually clean your makeup bag). Hint: If you think this may get messy, line your floor or table with newspapers; when you’re ready to clean up, you can just roll up the papers and toss them in the trash. Minimal cleanup required! 2. Remove any trash or random items. Who knows how many tissue squares, bobby pins or hair ties have accumulated into the average makeup bag. Not to mention random items like a contact case, ink pen, or cat toy. Toss trash into the trash can. Separate the remaining items into piles. For example, you can have a pile of hair accessories, one for miscellaneous bathroom items, and another spot for other stuff (such as cat toys). Don’t forget to gather together your makeup items too. Now you’re ready for step number 3. 3. Separate makeup into two piles. Look at that mound of makeup! We’re not quite done piling. Separate your makeup into two piles: one for the items that you use regularly, and the other pile for ones that you wear less frequently. Consider which items you wear every single day (mascara, foundation, face lotion, etc.). Obviously those go into the first pile. Think about the ones that you only apply on special occasions (the extra fancy eyeliner, colorful eye shadow, blush pallet, lip liner, etc.). These will naturally fall into the second category. Perhaps you have a middle spot for things you wear semi-regularly. Maybe you have makeup that you only wear on Sundays to church or for a date night. You can decide where to place these things. If it’s easier to keep them in your daily bag, go for it! But if it’s not too much trouble, place them in another bag or drawer that’s easily accessible. 4. 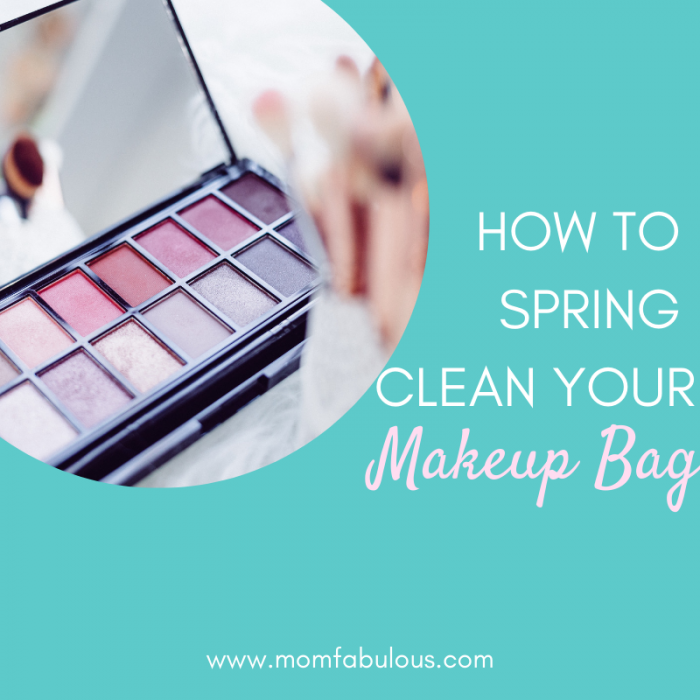 Clean your makeup bag. Whew, your bag is empty and all of the items are sorted. Now it’s time to clean your bag. It’s best to use a makeup bag that is lined with plastic or a similar coating for easy cleaning. Dump the bag into the garbage if there are crumbs or small bits of trash still inside. Turn the bag inside out and wipe down with a damp cloth or baby wipe. Dry with a clean towel, then turn the right side out again. If you want to be extra thorough, wash your bag in the washing machine on a gentle cycle. Allow to air dry. 5. Replace all of the necessary items. Remember your handy piles? Place all of the makeup in your “daily wear” pile back into your bag. You may also have decided to include the “occasional/weekly” makeup in this bag as well. Put your makeup bag back into your bathroom cupboard or makeup table drawer, wherever you normally store or apply your makeup. Wondering what to do with the other pile of makeup? That’s step #6. 6. Find a home for the less-used items. Place the less frequently used makeup items into another makeup bag or drawer. Don’t feel the need to throw these away unless you truly never wear them. It’s handy to keep a stash of extra makeup for special events, for a friend looking to borrow or try out an item, or for the one mega party per year that requires extra supplies. Most women keep a bag of extra makeup, including new products that you’ve already purchased while you’re finishing up the last of your remaining product. This is the best place for new tubes of mascara (buy 2 if they’re on sale), your off-season color of foundation (a darker shade for summer, and a lighter tint for winter), or other options of lip color. 7. Find a home for the unnecessary items and trash. If you’ve discovered more trash along the way, toss that into the garbage. Now is the time to put away hair accessories, bathroom products, or cat toys that somehow managed to find their home in your makeup bag. Doesn’t it feel refreshing to have a cleaned out makeup bag, where it’s much easier to find products that you wear daily? It’s also nice to know that all of your other makeup supplies are handy in another bag or drawer if you need them, but that they aren’t cluttering up your bag on the regular. Happy Spring! What else have you been Spring cleaning?